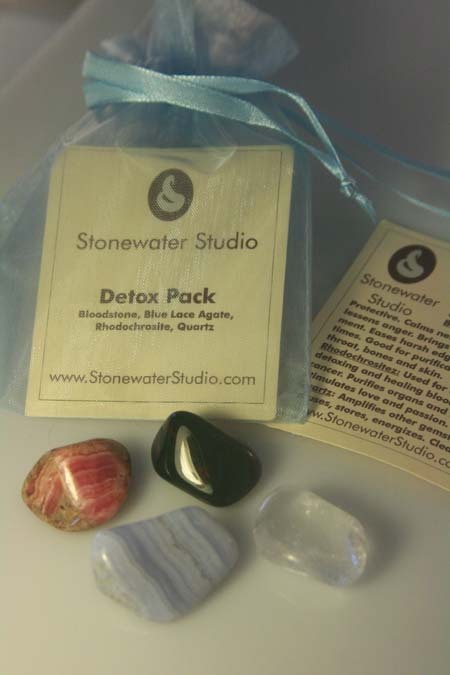 The Detox Pack combines the healing and balancing benefits of a variety of gemstones. Bloodstone purifies the blood and detoxes the kidneys, liver and spleen. Blue Lace Agate calms nervousness, purifies and aids with throat, bones and skin. Rhodochrosite is used for clearing, detoxing and purifying the organs and blood. Crystal Quartz amplifies the other stones. All the gemstones are cleansed (of any foreign energies) and charged in full sunlight. Comes packaged in a handy pouch with details about the gemstones. Great to carry or use in baths or elixirs.